I have no doubt that if we are to explore the effective use of resource then we should be looking at the whole life of a vehicle, from constituents to its dismembered parts rendered for re-use. I am quite sure I am unable to explore that. On the other hand, while writing this group of essays I discover that there are many figures for ‘efficiency’ and that these conflict and confuse, so I try here to sort out some of the mess. Fuel efficiency² is the effectiveness of a process that converts chemical potential energy contained in a carrier fuel into kinetic energy or work. Overall fuel efficiency may vary per device, which in turn may vary per application…¹ This leads to a general preference to use fuel consumption figures, which compare (obviously) distance covered against fuel consumed. The English-speaking world prefers fuel economy over fuel consumption. See ³ and ⁴. Energy efficiency is similar, but units are in MJ or kW-h (or, for things that are not cars, perhaps GJ, kcal or even BTU)⁵. Energy content has two forms, ‘high’ (liquid water in the exhaust, so higher, as the latent heat of vaporisation is included) and ‘low’ (only steam in the exhaust). The wikipedia table I found and copied some of below uses the high values ⁶. The wikipedia article¹ I read (used) tells us that diesel-fuelled cars have an energy efficiency of typically 30% (up to 41%) and petrol-fuelled cars typically 20% (to 37%). By comparison, an electric motor over 70W typically exceeds 70%, a fuel cell 85%. The use of percentages is common and confusing: these refer to the energy transferred (into motion, kinetic energy ?) compared to what was supplied (presumably by burning the fuel). Clarity is escaping again, and I’m still not sure we’re comparing like with like. • I read elsewhere that running (jogging) is more efficient than fast walking at around 5mph⁹. Which probably means that the fast walk is better for you than a slow jog. • comparison of fuel costs and efficiency should include those of manufacture of the fuel. • stopping is inefficient in terms of energy use, so regenerative braking is a Good Idea. There is some interesting available reading on energy use on trains. Does this help ascertain to any extent whether we should change the way we view personal transport? I am far from sure about anything here. Too much information conflicts because, yet again, there is too little clarity when a number is produced. We need not just the headline, we need access to the background when we want to use (understand and use properly) some information. In order to defer the dreaded moment of losing the car forever and having already had my moan about driving being no longer exciting in Britain I record a small point; I drove home from Oxford via a daft route that left me coming over the Pennines on B roads. This was fun and within the speed limit – and my consumption sank from 65mpg before I started playing to 63mpg over the whole trip, so it was cheap fun (though perhaps less so for the people I passed). Along the same lines I looked up¹¹ what we might do as motorists to reduce consumption when traffic conditions permit. Going a tad slower has an effect. Those long stretches of UK motorway with a 50 limit push my consumption ‘down’ by 10% (58 goes to 63); keeping a greater distance to the car in front allows me to adjust speed at a slower rate then ‘them’, reducing acceleration – this can be described as ‘driving less aggressively’ and includes the advice ‘Use cruise’. My car already cuts out when idling (once warmed up); I can see the (bad) effect of using air-con; I can keep less in the car (less weight, better efficiency); I can check the tyres and choose car / tyres options that minimise running costs; you can use the brakes less (I’ve been criticised for not using them at all many times, a vestige of biking); you can discover the best speed for your car in each gear [example; we have 20mph zones locally; I discover that idling in 4th (no pedal) gives 20mph and good consumption figures]. On a larger scale, I can choose to not use the car (but there comes a point where you’re (much) better off not owning one at all, as I did for several years, using hire as needed). You can put less fuel in the car (less weight, but fill more often); you can avoid wasted trips, plan ‘better’ routes and so on. I’m reminded about a comment on driving in China: “the Government wants you to buy a car, just not to use it”: buying delivers loads of taxes, driving it brings loads of congestion. This may bring an end to me looking at transport. I think there are some exercises to write [in “the Sixth: Other..”] to illustrate some of the thinking and offer persuasive evidence to cause change of behaviour. That, changing behaviour, is something of interest. I don’t find it too hard to persuade myself to change behaviour, once I have been presented with (or have found) evidence of a need or justification for the consideration to change. How one changes the behaviour of our society is a far harder task to consider in another essay, perhaps with even less success. 2 http://auto.howstuffworks.com/fuel-efficiency surprisingly unhelpful, I thought. 3 There is potential for a good deal of confusion in units for fuel consumption. 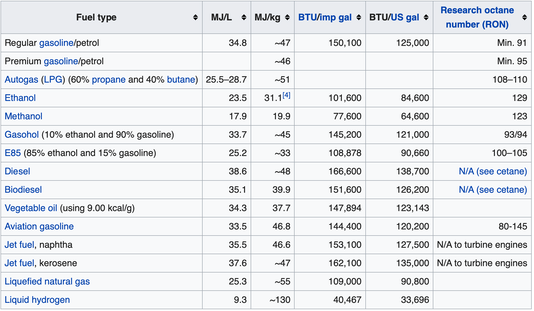 Imperial Britons (thus including others using these units) use miles per imperial gallon and Americans (and their followers) use miles per US gallon. Continental Europeans use litres per 100 kilometres, which will decrease as consumption improves. This is therefore fuel consumption, not fuel economy; consumption is fuel per distance unit, economy is distance covered per unit of fuel. This ought to be in an exercise considering which is the independent variable. The US gallon is smaller (so ten-gallon hats aren’t quite as big as you think); An imperial gallon is 4.54609 litres, based upon the volume of 10 pounds of water at room temperature. The US gallon is defined as 231 cubic inches, 3.785411784 litres. A dry gallon is 4.40488377086 litres, falling into disuse. so the imperial gallon is 20% bigger than the American one, and the US one is 16.7% smaller than the British one. The confusion comes when you find mpg on an American site, so we have to find European or British figures and results of the standard driving tests for fuel economy, such as ‘the urban cycle’. 6 It is difficult to transfer tables from Wikipedia - what I did was copy and paste to Excel, fiddle with the file, save it as a pdf and then crop the resulting pdf before dragging it into place. This fixes the usual formatting issues (it is more of a picture than ordered text). Let me know if your browser does not show this correctly, please. 7 I love this, from the first link ¹ : The average fuel economy is higher in Europe due to the higher cost of fuel. In the UK, a gallon of gas without tax would cost US$1.97, but with taxes cost US$6.06 in 2005. The average cost in the United States was US$2.61. Consumers prefer "muscle cars" but choose more fuel efficient ones when gas prices increase. A better comment is nearby; In parts of Europe, the two standard measuring cycles for "litre/100 km" value are "urban" traffic with speeds up to 50 km/h from a cold start, and then "extra urban" travel at various speeds up to 120 km/h which follows the urban test. A combined figure is also quoted showing the total fuel consumed in divided by the total distance traveled in both tests. A reasonably modern European supermini and many mid-size cars, including station wagons, may manage motorway travel at 5 L/100 km or 6.5 L/100 km in city traffic, with carbon dioxide emissions of around 140 g/km. I’ve used only litre/100km units in the next comment; convert that as x to imperial mpg with 282.481/x. Remember, a lower number is better, in terms of fuel economy. An average North American mid-size car uses 11 city and 9 highway; a full-size SUV usually uses 18 city and 15 highway. Pickup trucks vary considerably; whereas a 4 cylinder-engined light pickup can achieve 8, a V8 full-size pickup with extended cabin only travels 18 city and 15 highway. 9 and this was hard to rediscover. Livestrong.com implied that in excess of 4mph power walking uses up more calories than running. This supports that, saying maybe 4.5mph is the boundary, to do with walking being inefficient at speed walking. This seems sensible to me; change of gait must have sound underlying reasons. 10 You think I jest? Try googling some comment such as ‘walking is bad for the planet’, as I did, but walkit.com didn’t load. Arguments run along the lines that (i) the biology is less efficient than the motor (likely, but where do you start the measurement for comparison?) and (ii) our food production is worse for global warming (‘the planet’) than our fuel supply is (and the motor industry?). Such as here, which is arguing the opposite, and does so quite well. We’d do better to give up meat (than our cars), it says here. [I got the walkit thing to load by going to the ‘going green’ then to the blog and then finding a reference to Jamie’s arguments that walking is/is not good for the planet. Chris Goodall in 2007 argued that “Walking three miles uses about 180 calories. Replacing the energy used, assuming you don’t want to lose weight, would mean eating about 100 grammes of beef. Of course, it depends on the cut of meat, and how much fat it contains, but this figure is reasonably typical of beef in British shops. The scientists in Japan give a figure of 36 kg of emissions for a kilo of meat, so a portion of 100 grammes equates to about 3.6kg. This is the first part of the calculation – it shows that one 3 mile walk generates 3.6kg of emissions if one replaces the lost energy with beef. 11 Hardly; I wrote this without looking anything up and then checked by googling. Read this and this, this and this . 64 I could not find this at ATOC (latest publications) but there’s lots of stuff to read. http://www.atoc.org/clientfiles/files/publicationsdocuments/nps65A6_tmp.pdf for example, told me, without backing up the info with a citation I could find, that travel from London to Edinburgh generated 42g CO₂ per kilometre on rail, but 127g by road (which is more than the figures for my car, 109h/km). the more I read the more I felt insulted, dumbed down to. I expected a far better information supply; it is as if this is written for the industry to applaud. Is that then writing to satisfy one’s finance source? Should this not be more independent? Thinking back to days at CICA, I’m bothered by this apparent spin.